Founded in 1931, Garelick Farms manufactures a wide variety of beverages including milk, flavored milk, cream, orange juice, iced tea, lemonade, and fruit punch. The company, which prides itself on its fresh, delicious dairy products, has grown from its humble beginnings (when two brothers home-delivered bottles of milk) to become part of Dean Foods with over sixteen hundred employees and four large production facilities. Garelick Farms’ plant in Franklin, Massachusetts, is one of the largest single-plant fluid operations in the USA. This plant produces a full line of milks, creams, and orange juice, and discharges its wastewater into the local sewer system. Wastewater is collectively treated (along with wastewater from several other area communities) at the Charles River Pollution Control District’s waste treatment facility. Garelick Farms’ significant growth, in addition to that of other industries in the area, was straining the capacity of the District’s treatment facility. As a result, the District imposed pretreatment requirements of < 1000 lb (454 kg) per day of biochemical oxygen demand (BOD). Garelick Farms required a reliable wastewater treatment solution to meet these limits. Garelick Farms’ consultant investigated many wastewater treatment options and recommended an equalization and pH adjustment approach followed by low-rate anaerobic treatment. ADI Systems' proprietary low-rate anaerobic ADI-BVF® reactor performed well in the pilot study at Garelick Farms, which gave the dairy confidence as to the high performance it could expect from the proposed technology in full scale. ADI Systems proceeded with a complete design/build package for Garelick Farms. This included process and detailed design, and the subsequent supply and installation of screening, pumping stations, an equalization tank, BVF® reactor, and an aeration tank. 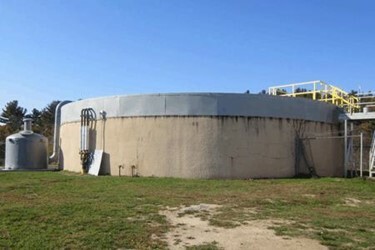 The biological treatment system consists of a 4.2 MG (16,000 m3) Type S BVF reactor followed by a 0.6 MG (2,300 m3) aeration tank; both the reactor and aeration tank are above-ground concrete tanks. The reactor is covered with an insulated, floating cover system to eliminate odors, as well as collect biogas, which is then burned. The aeration tank uses a diffused-aeration system to provide aeration and mixing. The system includes a small boiler to heat and maintain the reactor at 80°F (27°C), although heating is usually only required in the winter months. The BVF reactor was an ideal solution for treating the dairy’s wastewater because of its tolerance to shock loadings, as well as its ability to treat high concentrations of total suspended solids (TSS) and fat, oil, and grease (FOG). The subsequent aeration system sweetens the anaerobic effluent to prevent odors and corrosion in the public sewer system. The wastewater pretreatment system ADI Systems designed and installed for Garelick Farms has helped the dairy reduce TSS and FOG loading to the local sewer, as well as comply with biochemical oxygen demand (BOD) limitations.